Tis' the season to be jolly, right? WRONG, Tis' the season to be stressed, tired, grouchy, overwhelmed, depressed, anxious and if you don't take care of yourself, sick! Well how do you avoid some of the pit-falls of the holiday season you ask? Simple, start by putting yourself FIRST. Carve out some personal time to take a nice,relaxing bath, but not just any old bath, a DETOX bath! 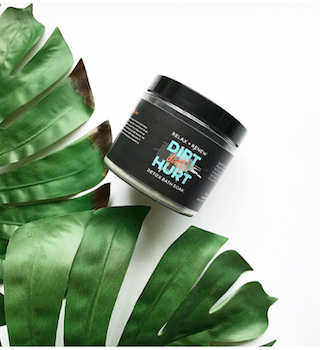 Dirt Don't Hurt's All Natural, Earth + Plant Based Detox Bath Soak, is designed to help you detoxify while you relax, renew, rejuvenate and prepare for the rest of the busy hustle and bustle of the holiday season. Seriously, it only takes 20 mins and it makes a world of difference! Nothing is more relaxing than a hot bath… except maybe a relaxing, warm, detox bath that also helps to cleanse your body inside and out. The holiday season can be such a fun and festive time of the year. But if you are busy racing around like a crazy person; shopping, cooking, cleaning and preparing for parties and house-guests, thus allowing yourself to get run down, what fun is that!? Again, one way to ensure that you are taking care of yourself first, is to set aside some down time to help you relax, rejuvenate and de-stress. A Detox bath is great for removing toxins, as the Bentonite Clay binds to heavy metals and the Epsom salts and Activated Charcoal help to pull a variety of toxins from the body while at the same time replenishing magnesium levels. So, if you are anything like me and you are still wondering how is it even possible that we are already full swing into the holiday season? Then don't let the rest of the season get away without you taking some time out for yourself. YOU deserve it. Your health should be your main priority, and as 2017 is quickly coming to a close, you want to make sure to start off the new year feeling renewed, relaxed and healthy. Also, make sure to take your Detox Bath in the evening as they tend to make you tired, so I suggest doing them before bed and prepare for a long, restful night of sleep. Oh and did I mention that the Detox Bath Soak is on sale for $29.99 for a limited time? Go ahead and snag one, you can thank me later.